Kate wants to save all the flowers from dying before winter. But Kate learns that some flowers will come back in the spring. Those are called perennials. Some don't come back, and those are called annuals. Kate pots up as many annuals as she can, and brings them all inside. She forgets that Dad is allergic. What will Kate do now? Arbordale Publishing has aligned this book to Next Generation Science Standards, Common Core and all individual state standards. Saving Kate's Flowers has been recognized with a Society of Children's Book Writers & Illustrators 2017 Crystal Kite Award for New York. Each year, 15 books are honored from U.S. and international regions from more than 1,000 nominated books. SCBWI is the only professional organization specifically for those individuals writing and illustrating for children and young adults. 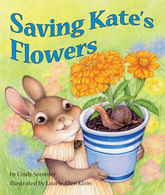 -Suitable for ages 3-8, this book teaches kids about flowers, gardening, and seasons in a humorous and touching way. -Great tool for parents, teachers, and day care providers to facilitate discussions about life cycle of plants, and allergies. -Fun and educational interactive activities in the back of the book. Cindy Sommer's love for gardening started at a young age while admiring her mother's green thumb. She passed this love of plants on to her daughters, who are the inspiration behind her debut picture book, Saving Kate's Flowers. Along with gardening, Cindy always had a passion for writing, a passion she cultivated with a BA in English from SUNY Oneonta. Cindy does her gardening and writing at her home on Long Island, along with her husband, two daughters, two dogs, and a horse. Cindy will only travel to locations in Nassau and Suffolk Counties. Her presentations for children in Pre-K to 2nd grade are typically 30-45 minutes long, but times can be adjusted. Cindy requires that teachers or adults be present through the entire program. The material is best presented to smaller groups of children preferably no larger than 30. However, for larger groups, (up to 100 students) the author brings her laptop and uses the school's projector so everyone can enjoy the illustrations with PowerPoint. She likes to arrive an hour earlier to ensure that the equipment is working properly. For Pre-K/Kindergarten: After reading her book, Cindy has the students re-create a scene from the book using a felt board. Then they pretend they are seeds using props and interaction. Much giggling is expected. Activities may vary due to time and number of students. Crafts can be provided for an additional fee. Q&A period if time allows. Approx. 30 minutes. OTHER PROGRAMS OFFERED: For libraries and bookstores, or if a full educational program is not desired, Cindy will read her book and offer a simple non-messy, flower themed craft. Approx. 30 minutes. FEES: Cindy charges $300.00 for one presentation up to an hour. (Can be two half hour programs. )$900.00 for full day, up to four presentations. Maximum 100 students per presentation. Preschools are given discounted price. To have the author attend a vendor event for book signing/selling books. - No charge. A hardcover copy of the book is donated to all school libraries who have an Author Visit. Schools are given a discount directly from the author or through Arbordale Publishing. Order forms can be obtained from the author or found online at their website at www.arbordalepublishing.com. Books may be ordered directly from the author or www.amazon.com. Please order books a month in advance. If ordering from author, please give 2 weeks. Books can also be ordered from your local bookstore, but you would have to arrange for your own discount with them. Cindy's program has been accepted by Eastern Suffolk BOCES. See their online catalog.